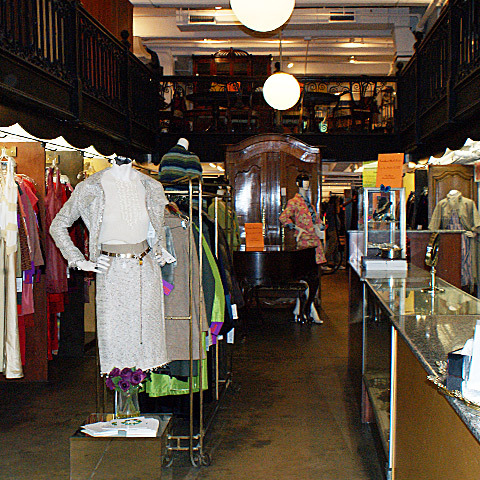 City Opera Thrift Shop supports the creation and design of costumes for productions at the New York City Opera. Browse two floors of gently used articles and clothing for men and women, while classical music softly plays throughout the store. The main room has the look and feel of a large spacious closet with individual dressing rooms. With its high ceiling open to the second floor, it is more like a boutique than a thrift shop offering a nice mix of vintage and modern pieces. The meticulously kept interior is organized with different departments brimming in well cared for quality donations. Designer label dresses, separates, outerwear, shoes and jewelry can be found on the main floor. Upstairs you will find more clothing and shoes, along with furnishings, artwork, dishes, brick-a-brac and even a book corner. Whether you are donating something old or shopping for something new, it's a great way to support the arts and be green at the same time. Call City Opera to arrange for free pick up service throughout the 5 boroughs for gently used items or taxi fare reimbursement (up to $12 with receipt). If you prefer to deliver your donation, City Opera will reimburse taxi fares up to $12 with metered taxi receipt. Gently used designer and well cared for clothing for men and women. They also have a nice selection of fashion accessories, jewelry, furnishings, dishes, books, records and decor.